“The world is not made of atoms. It is made of stories.” The late poet, Muriel Ruykeser, once said. I always believed that every human has a story to tell. The way they tell their story will not only impact their own life but also the lives of those who hear it. I am so grateful that my life was recently enriched with 19 new amazing stories I just experienced during a two-day speaker training in Milan. A year ago, in my role as YPO Gold Regional Learning Officer for Europe, I was encouraged by YPO European regional leaders, Erik Petersen (YPO Denmark Gold) and Anastasios Economou (YPO Euro Star, YPO Greater Germany) and the incoming leaders Ángel García-Cordero (YPO Euro-LATAM Gold) and Greg Urman (YPO Paris) to start something I’ve been talking about for a while – the YPO Change Makers Club. In my many years in YPO, most speakers that left a lasting impact on me were not professional speakers; they were YPO members. Their talks were personal, relevant and shared in the spirit of the organization’s mission: Better Leaders through Lifelong Learning and Idea Exchange™. My thought was, why not create a club of members who want to give back to the organization and society by volunteering to share their time, expertise and stories with other members? A year later, with almost 40 volunteer speakers and 16 engagements with chapters, we held our inaugural speaker training in Milan. Our mission is to inspire YPO members to make a meaningful difference in their life and the lives of those they touch. We provide YPO events with exceptional member/spouse resources. 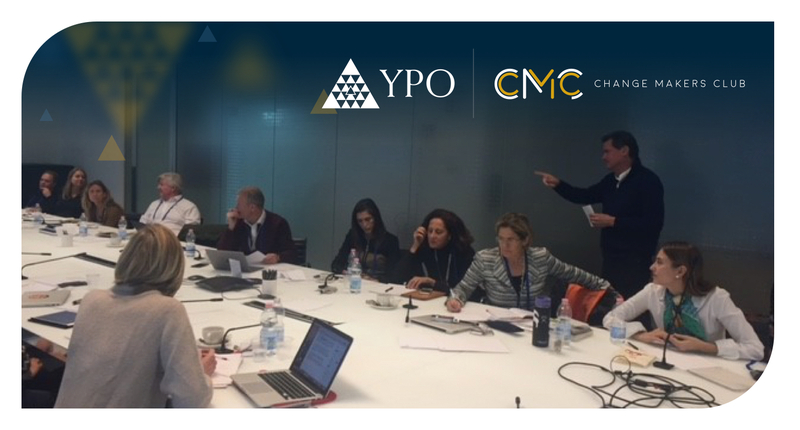 We select and train YPO Change Makers who volunteer their time to share their stories and expertise with other members during chapter, regional and international events. But YPO Change Makers are mainly about, giving, impact and purpose. Giving: Giving is addictive and contagious. Change Makers give their time and share their stories to inspire other members to volunteer and share. Impact: YPOers influence their communities and businesses. Change Makers influence the influencers. It’s an effective recipe to exponentially impact the world! Purpose: it’s mostly about living our own individual higher purpose, where we expand our ideals through sharing important lessons from our lives with others. By the second day, as the group connected more deeply, the stories came to life! Another poet, Maya Angelou, said: “I’ve learned that people will forget what you said, people will forget what you did, but people will never forget how you made them feel.” This might be true in most settings but even as we laughed and cried, speakers also delivered a take home value, a lesson that can be applied to improve one’s life, family or business. I would like to share my take home value from those Change Makers who delivered their speeches in Milan. Purpose ignites Passion, Passion Fuels Performance and Performance drives growth. Don’t let your industry define your business. If your Garbage Man can build a world class business, then so can you! Don’t let your parent or loved ones ever feel “ they have nothing to contribute anymore”, create a Project for them to LIVE for. The art of living well is enhanced by being bold enough to be vulnerable about dying well and with that knowledge both you and your loved ones will find it easier to be at peace. Love your fear, be compassionate about it. Accept it. Peacefully. Get it out, share it, don’t let it become a monster. Only then, face it with determination and resilience. And, gently, it will go away. We have no choice. If we want to be successful today, and even more so tomorrow, we should put our profits aside and become part of the economy of meaning. Dance is the embodiment of life through mind, body and soul. It enables an escape from the constant pull of technology becoming a short cut to happiness and health. Live a life from within, so you be who you are, love what you do, have what you want and share it with the world. “Out of suffering emerged the strongest souls” Khalil Gibran. Transforming THE major trauma in your life into a persona defining meaningful event. Empowered local entrepreneurs become social Changemakers by starting where they are, using what they have and doing what they can! Raising your Love Quotient (LQ)’ gives you proven tools for great business results. Let yourself and the people around you feel Safe, Seen and Supported (Triple S) and experience the tremendous benefits for your business and private life. If your pause and rhetoric is in place, magic happens. Philanthropy as a business: Ensure ROI when doing good. Wine is Culture, Wine is connection, Wine is communication – Drinking a glass of wine is like drinking from the chalice of life! Tackle the elephants in your room both at home & work to unlock relationships and value. Each of these change makers enriched their peers in a different way but they all had one thing in common: they all provided actionable content and shared our mission in becoming better leaders. I am on a constant learning journey and so are my fellow YPOers. Whether you are a member or a spouse, in an officer role or not, we all play an important role in helping to define the lifelong learning and leadership journey in our chapters. Therefore, I invite you all to engage with our Change Makers as they provide truly ‘Only in YPO’ value money can’t buy.